Even though both Domenico and I had experience in restoring homes in Italy he designing them, me writing about them – my real learning experience came through the odyssey of finding our own pile-o-rubble and turning it into the home it is today. Domenico had been working in Umbria for several years, restoring homes for clients. 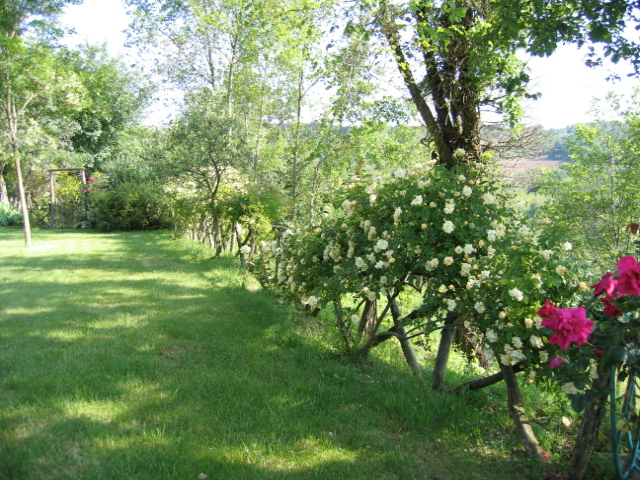 Each summer we would rent a house in the area, getting to know both the people and the countryside around Todi. We knew we wanted our own place, but a restricted budget and the growing popularity of the area made finding the perfect place seem near impossible. We followed every lead. A carpenter lead us to an isolated, crumbling tower which seemed perfect. That is until we discovered it hovered over a very pungent pig farm below. Another farmhouse slipped through our fingers at a public auction. One day, looking rather forlorn, we were having a cappuccino at the local bar in Izzalini. The postman asked why we looked so sad. When we told him how pessimistic we were about finding a ruin to restore, he said he knew just the place: the house of Tomaso. We wound up at what seemed like a dead end in a sunflower field. A farmer was kind enough to lead us, with me puffing and panting I was eight and a half months pregnant with our first child, Sophie up a steep hill to a vine-covered stone farmhouse, seemingly untouched for decades. Although obviously derelict and abandoned to the elements, the weathered stones and rickety beams still held some promise. But it was when we turned our backs to this romantic heap that we were sold. The view was breathtaking: cultivated fields alternated with woods, vineyards popping up in between. There was even a crenellated castle on the next ridge, with a row of cypresses marching across the horizon. We knew we had found paradise. It had taken us over two years to find a place, and then another year to convince Tomaso to sell us Pergolaccio. We were now more than ready to begin the fun part, brining our ruin back to life and creating a home for our growing family (second child Emma was on her way). By now Domenico had restored over a dozen such houses in Umbria and Tuscany and I was a regular contributor to a variety of architecture and interior design magazines. We knew exactly what we wanted. Almost as importantly we knew the pitfalls to avoid. Subsequently our adventures in restoring Pergolaccio went surprisingly smoothly, and amazingly fast. A mere 9 months passed between the first scrape of the backhoe and our first night spent under our new roof. The house we found was, like many in the area, originally built for two families. Two outdoor staircases led to two separate apartments on the second floor. The ground floor was reserved for the animals. Hacking our way through the rampant vines which covered the entire ruin, we discovered yet another, semi underground level below the stables. Over the years the house had begun to be overtaken by the woods that surrounded it. Glimpses of the view out over the valley were tantalizing, and we began to slowly thin the trees towards the front of the house. While we loved the feeling of protection they gave, we also wanted to watch the sun set over the hills. Yet at the same time we were adamant in saving two of the most splendid features of our house, an ancient walnut tree and an immense Elm, which stood at least 2 yards over the roofline. While our house had most of the external walls in tact when we first saw it, there wasn’t much else to define it as a potential home. The roof was, for all intents and purposes, gone. This meant that the elements had done their damage: supporting interior beams had rotted away, letting the floors and tiles crash to the ground. Door and windows had similarly disappeared. Even deciding on a floor plan was a leap in the dark, since many of the spaces – including what was to be ground floor guest suite, the living room and our bedroom were entirely inaccessible due to the dereliction of the building. Yet we forged ahead, ready to alter our plans as construction progressed. This part not having a strict plan to follow through the project is one of the most perplexing parts of restoring a house in Italy, especially for foreigners. As our contractor repeated innumerable times, it would have been much easier to tear the place down and build from scratch! Yet we wanted to retain as much as possible of the old structure, even if it mean altering our plans if we came across a buttress that needed shoring up, or a doorway that needed to be closed. This is, of course, one of the scariest parts of restoring a home in Italy, since it is hard to foresee the budget with any real accuracy. As foundations were dug, and walls rebuilt, we began to collect the elements which would lend our house a lived in air. Domenico painstakingly visited his sources, collecting 14 sets of antique doors. Our contractor, poetically named Dante, managed to nab some old discarded paving stones from the main piazza in Todi, which we used to create steps. The stone mantelpieces in the kitchen and the living room came from an old man in the Marches, who salvaged them from abandoned farmhouses. Texture was very important to us, and so we used hand made terra cotta tiles throughout ground floor. Rather than wax them to a shiny finish, as is the norm, we opted to leave them in their rough, matte state. Upstairs, on the bedroom level we made the brave choice of using wood for the floors. Rarely is wood used in Italian country homes, for no other reason other than following age-old tradition. We were lucky enough to have a friend, Paolo, who had cut down several cypress trees a decade before. The wood, beautifully seasoned by now, was cut into uneven lengths and widths and hand installed by Paolo. Its fragrant pine scent was an added bonus we hadn’t planned on, and, eight years on, still fills the house with its perfume. One of the most important design decisions was, in fact, a bit of an experiment. Domenico had always wanted to incorporate the pigment directly into the final coat of plaster, rather than simply painting the walls. He sensed this would give an added layer of texture to the rooms, making the colors appear part of the fabric of the walls. The contractor, who had never attempted this before, was hesitant to try. Yet soon Dante was grinding terra cotta and mixing it into batches of plaster with raw pigments Domenico had brought up from Rome. The result was splendid. Each room is slightly different, all warm earth tones, which seem to glow on their own and give the house the cosy feeling everyone remarks upon. Since cooking is a large part of my life, I knew from the very beginning that the kitchen would be the most important room in our home. Deciding where to place it was the first decision to make. The original kitchen had been on the upper floor, which would have been impractical. We chose to knock down a wall between two small stables, and create one large space which would serve as both eating area and working kitchen. When we first started working on plans for the kitchen, my wish list was quite long. Happily, the large space enabled us to include almost all of the things I had ever dreamed of in a kitchen. The working area of the kitchen focuses on a central island, which separates the two zones. This oak topped piece of furniture manages to incorporate a book shelf, a spice rack as well as two deep rolling drawers for pots. What cant fit in the drawers is hung from a hanging rack above. But for all my kitchens modern conveniences, my favorite part is the large open hearth. Although it looks as if it had always been there since time began, it was actually designed by Domenico; it incorporates an antique lintel as well as old paving stones from the piazza in nearby Todi. Throughout the winter months, we never let the fire go out.